No trip to Charleston, South Carolina, would be complete without a visit to The Center For Birds of Prey. Today we spent a gorgeous spring afternoon there learning more about the raptors that we love and photographing the birds during the flight demonstrations. We’ve been there so many times that the staff remember us, and today Steven jokingly told Cameron that he couldn’t answer all the questions and ruin the tour or Cameron could step up and do the job for him. We laughed. Even though we’ve been on the tour a dozen times, we still learn more each time and see new birds. To date, they’ve rehabilitated more than 400 birds of prey that have been injured, mostly due to vehicle accidents. Some that are unable to return to the wild become full-time residents and participate in the demonstrations, allowing visitors an opportunity to see them up close and to better understand their species and characteristics. Cameron and I always say that if we lived closer we’d become volunteers so we could contribute to their efforts. It’s just an amazing place, with incredible birds and people who do great work to save them. 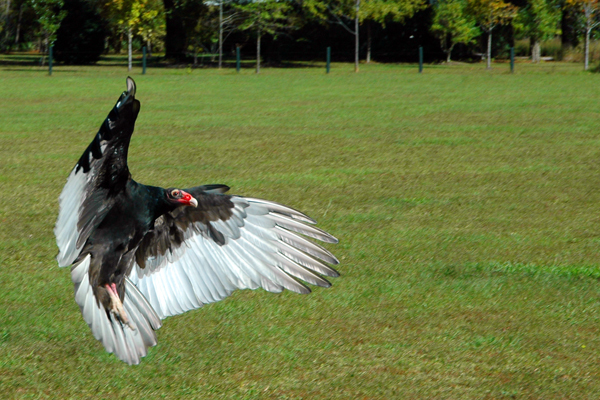 Here is one of Cameron’s favorite photos, a Turkey Vulture he caught in mid-air about to alight on a perch. For more photos of these great raptors, please see my photography website.